Windstar sets sail with just 310 guests on James Beard Foundation Culinary Themed Cruises with Guest Chefs Anthony Sasso, Evan Hanczor, Emily Luchetti, Jose Mendin & more in 2018. Through our new 3-year partnership with the James Beard Foundation, we are pleased to introduce an array of incredible culinary superstars sailing aboard Windstar's award-winning small ships. Windstar Cruises and the James Beard Foundation are serving up the best reasons to explore the world through expert-led, locally-inspired cruise cuisine, as the award-winning small ship cruise line and preeminent American culinary organization sign a multi-year agreement to continue their exclusive partnership, through early 2021. The long-term partnership is a result of past successes of the unique travel-culinary program, which hand-picks acclaimed culinary experts to share their knowledge of cuisines of the world with travelers, and showcases exclusive recipes and experiences on sailings across Windstar’s fleet of six elegant ships. The relationship began in 2016 and grew in 2017 into an exclusive partnership naming Windstar the Official Cruise Line of the James Beard Foundation, a title that embodies the line’s commitment to elevated epicurean experiences around the world. On six culinary themed sailings yearly across a variety of Windstar’s sailing regions, a James Beard Foundation-selected chef and beverage expert will charm guests with multiple culinary and beverage (wines and spirits) tastings and demonstrations, special and local menu items, wine-paired meals, unique culinary shore excursions, and local market tours with the chef. The program is designed to allow cuisine savvy travelers plenty of personal interaction with sought-after culinary experts. The 2018 line-up features James Beard-recognized guest chefs along with renowned sommeliers and mixologists sailing aboard Windstar’s intimate, small ships is aimed at attracting well-traveled gourmets and oenophiles ready to explore international gastronomic experiences. Windstar is enhancing the flavor profile of small ship cruising with the new three-year partnership, expanding the breadth and diversity of culinary offerings with daily activities on board, new dining menus, enhanced beverage selections, and foodie-focused opportunities ashore. As the Official Cruise Line of the James Beard Foundation, cruise guests on every single Windstar sailing enjoy culinary demonstrations of James Beard Award-winning chef recipes and beverages prepared by Windstar chefs, as well as featured James Beard Foundation Signature Recipes aboard all Windstar sailings served nightly in AmphorA, the main dining room on each Windstar ship. Each dinner menu has featured recipes from a James Beard-recognized chef who has sailed with Windstar – including a starter, entrée, and dessert. Items celebrate the line’s global destinations and were developed for recent James Beard Foundation culinary-themed cruises with dishes from chefs such as Andy Ricker of Portland and New York’s Pok Pok fame, serving up Phla Plaa Tuna (Spicy Yellow Fin Tuna Salad) with Thai chilies, lime-coconut milk dressing, and jasmine rice. Other favorites include Marinated Grilled Lamb Rack with buttered new potatoes, preserved green and red tomatoes developed by Paul Berglund of The Bachelor Farmer in Minneapolis; and Pan-Seared Scallops with Thai green curry sauce and Asian mango slaw by restaurant powerhouse Jennifer Jasinski of Rioja, Bistro Vendome, Euclid Hall, and Stoic & Genuine in Denver. The James Beard Chef dishes are specially notated on the menu, and no “upcharge” or additional fee is charged for ordering these show-stopping dishes. Plus, AmphorA menus are on a 14-day rotation, meaning guests enjoy new selections every evening. Windstar prides itself on delivering destination authenticity to guests and each culinary expert has been specially-chosen based on his or her affinity and passion for the cuisines and cultures of the cruise itineraries where the culinary expert will sail. The intimate small ships of Windstar carrying fewer than 310 guests provide the perfect atmosphere for daily one-to-one interactions with these accomplished and personable ambassadors of the world of cuisine. Chef Anthony Sasso of La Sirena in New York, N.Y. Growing up as one of four children in Glasco, New York, Anthony Sasso was always surrounded by art, music, and creativity. After graduating from the Institute of Culinary Education in New York, Sasso’s culinary career began with stints at Union Pacific and Bobby Flay’s Bolo. He then found his way to a small corner spot on 17th and Irving: Andy Nusser’s Casa Mono. Soon after, Sasso moved to the Costa Brava to live with his extended family and work at the renowned coastal marisqueria “El Hogar Gallego,” which is run by the legendary Guillo family. When Sasso returned to the States, he was promoted to head chef at Casa Mono, and later began an apprenticeship at Fleisher’s Butcher Shop where he learned to break down whole animals. In 2008, Sasso became one of the youngest chefs to be recognized by the Michelin Guide, obtaining his first of eight consecutive Michelin stars for Casa Mono. He joined La Sirena in January 2017 as executive chef and is thrilled to return to the Costa Brava and surrounds on this cruise and to enjoy the fresh Spanish coastal bounty with Windstar guests. Beverage Expert Ashley Santoro of The Standard, The Standard Café, and Narcissa, New York, N.Y.
Curating the wine list for some of New York City’s finest eateries is no small chore. Enter Ashley Santoro, who had a humble introduction to the industry, bussing tables at the age of 15. Now, Santoro, the former wine director of Casa Mono and Bar Jamón, was recently named the regional beverage director of the Standard Hotels. During her tenure at Casa Mono & Bar Jamón, Ashley was responsible for building a program of 500+ exclusively Spanish wines, ranging from a vast collection of sherry to back-vintage wines from the Iberian Peninsula. In addition to her work at The Standard, she also devotes time to traveling and teaching wine courses. Santoro has been featured in numerous publications including The New York Times and Wine & Spirits Magazines. Chef Evan Hanczor of Egg in Brooklyn, N.Y.
Evan Hanczor is the chef at Egg, a farm-to-table breakfast-focused restaurant in Brooklyn with an outpost in Tokyo and a farm in the Catskills. He is the co-author -- with George Weld, Egg's founder -- of Breakfast: Recipes to Wake Up For and also the creator and curator of Tables of Contents, an edible reading series hosted monthly at Egg. When not scrambling eggs, he works on food policy with the James Beard Foundation’s Chef Action Network, collaborates with multi-disciplinary artists on culinary/artistic experiences, and partners with several food-focused nonprofits on both local and global issues. Evan is thrilled to join Windstar on a trip to the fjords to explore the natural beauty that influences the unique cuisine of the Nordic region, the amazing quality of its cold-water seafood, and the bounty of summer fruits and vegetables in the region, and to learn from a region that, though distant, bears particular similarities to the fishery- and small-farmer-dependent cuisine of the coastal Northeast. The accompanying beverage expert for this cruise will be announced soon. Pastry Chef Emily Luchetti of Marlowe, Park Tavern, and The Cavalier, San Francisco, CA. With six cookbooks to her credit and numerous awards, Emily Luchetti has helped to define what great pastry in America means. As chief pastry officer for Big Night Restaurant Group, she oversees the pastry operations for The Cavalier, Marlowe, Petit Marlowe, Leo’s Oyster Bar, and Park Tavern Restaurant. She was awarded the 2004 James Beard Foundation Award for Outstanding Pastry Chef and was inducted into the James Beard Foundation Who’s Who of Food & Beverage in America. With a passion for vanilla, Luchetti can’t wait to create exquisite pastry concoctions made with vanilla fresh from the islands and plans to accompany guests on excursions to local vanilla farms. Beverage Expert Shelley Lindgren of A16 and SPQR in San Francisco, CA. Owner and Wine Director Shelley Lindgren was honored by the James Beard Foundation in 2015 with the Outstanding Wine Program award for her work at A16. Her reputation for seeking out Italian wines made with lesser-known grapes has earned her recognition as a wine pioneer. She continues to search for evocative wines from around the world and plans to serve interesting pairings aboard Wind Spirit in Tahiti. Chef/restaurateur José Mendin co-founded and created the Pubbelly Boys restaurant group and the newly formed Food Comma Hospitality Group (FCHG), with notable Miami restaurants such as Habitat, Pubbelly Noodle Bar, Pubbelly Sushi, Baja Bao, and PB Ysla in Mendin’s hometown of San Juan, Puerto Rico. Mendin will be returning home on this cruise, which is a round trip journey from San Juan, bringing his ability to revitalize and re-imagine ancient and traditional recipes by maintaining the integrity of a dish’s roots while infusing it with modern touches. He earned James Beard Foundation nominations for “Best Chef: South” from 2012 to 2016. He looks forward to showcasing his love for big flavors aboard Star Pride and sharing his favorite restaurants and flavors with guests in San Juan. The accompanying beverage expert for this cruise will be announced soon. More Culinary Experts to be Announced: Guest chef and beverage experts for the following 2018 cruises will be announced soon: Hidden Harbors of the Côte d’Azur departing June 20; and Gems of the Adriatic Sea on August 7, both aboard Wind Surf. Windstar is known for many things on its iconic small ships, such as personalized service, Watersports Platforms where guests can enjoy the ocean, and access to small intimate ports larger ships can’t possibly enter. The line is also respected for its culinary programs – sourcing local food where possible, bringing guests to local markets to shop with the chef, baking all breads on board daily, preparing meals to order, serving regional specialties that vary by destination, and simply providing better quality ingredients. As the exclusive cruise line of the James Beard Foundation, Windstar will be involved as a major partner for a number of the Foundations’ annual endeavors supporting culinary excellence, growth, awareness, and advocacy including the Chefs Boot Camp for Policy and Change; the 2018 James Beard Awards at the Lyric Opera in Chicago, considered the ultimate prize in the world of cuisine; JBF’s Taste America® events – occurring in the fall in major cities around the country including fundraising dinners, complimentary culinary tastings and demonstrations with James Beard-recognized culinary experts; and a sponsor of Chefs & Champagne® — the James Beard Foundation’s annual summer tasting party in the Hamptons. 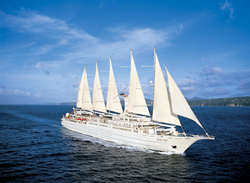 To learn more about authentic small ship cruising with Windstar, contact a travel professional or Windstar Cruises by phone at 877-958-7718, email info(at)windstarcruises(dot)com or visit http://www.windstarcruises.com.